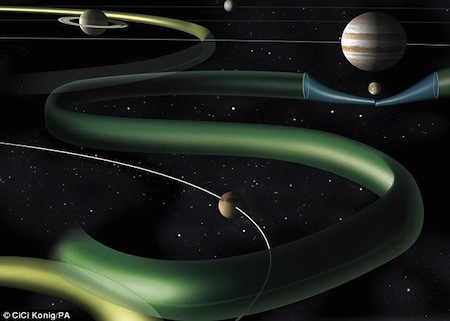 Gravitational corridors describe minimum energy pathways between objects in the solar system; they connect Lagrange points where gravitational forces balance out. The graphic below shows the twisting, ever changing pathways that could provide low speed but highly fuel efficient paths between planets and moons. He had travelled the space-lanes of the solar system for the greater part of his life, and now all of his time-honored rules of interplanetary navigation had been upset by this new cruiser. Commute ships roared on all sides, as Ed Morris made his way wearliy home to Earth at the end of a long hard day at the office. The Ganymede-Terra lanes were choked with exhausted, grim-faced businessmen; Jupiter was in opposition to Earth and the trip was a good two hours. 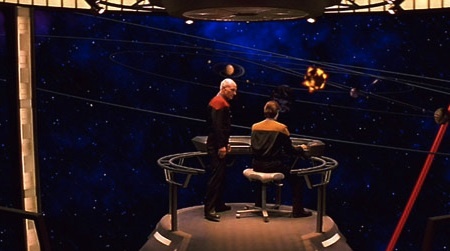 In more modern sf movies, you might want to use this stellar cartography room to plot these routes. Hardy spacefarers eager to ply the gravitational corridors between the Earth and Mars in real life should be prepared for a long voyage, though; it could take thousands of years. The best use for these "space-lanes" is as low-consumption routes between the moons of a planet like Jupiter. The only real-life space voyage to use this method was the Genesis spacecraft launched in 2004 to capture solar wind particles and return with them to Earth. Via Highways in the Sky; thanks to Moira for pointing this one out.